Occasionally we send out a small e-mail newsletter listing major additions to this website, and detailing the QA/QC changes to posted data. Sign-up here if you would like to be added to (or removed from) our list of recipients. We are now collecting "real-time" data from Amity Creek in Duluth, MN. Like the Stream Monitoring Units (SMUs) at Chester, Tischer, and Kingsbury Creek, it is sampling at 15 minute intervals for depth, flow, temperature. conductivity, and turbidity. This SMU uses newer technology -- allowing us to update the website 3 times a day. The data from the other streams is usually updated once daily (generally by 10 AM). Kingsbury Creek is still limping along. First it was hit by lightning this summer and now the data transmission phone line was damaged during some construction activity. Fortunately, it is still logging data although there is a delay in posting the data. You can use our Java-based Data Visualization applet to explore the data from the SMUs and create plots like the one above. 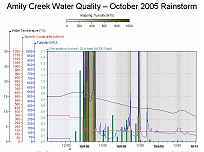 Weekly data files from Amity Creek can be found here. 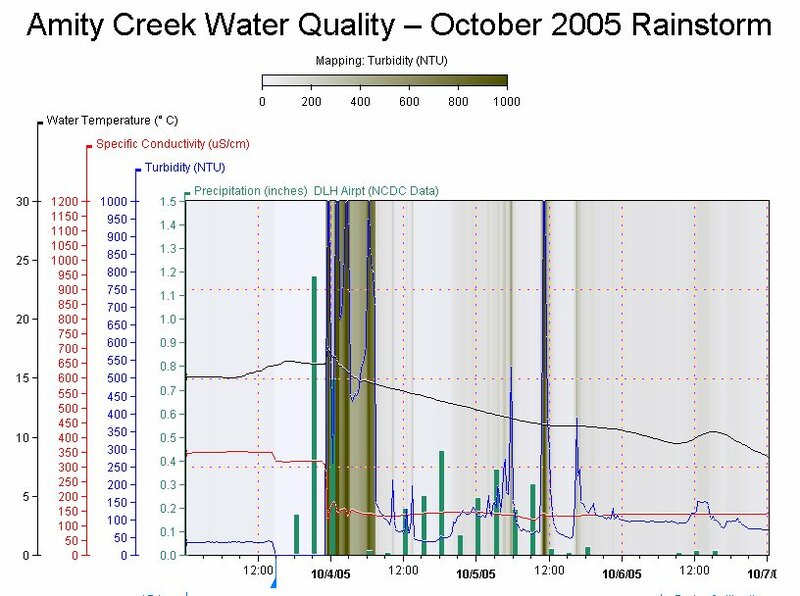 The Kingsbury Creek sensors are still out of commission, apparently from a power surge during the evening thunderstorm on 6/28/05. WOW has a link off the new Strange Days on Planet Earth website. This is a new National Geographic series on PBS. March 22, 2005 is World Water Day. It marks the start of the Water for Life Decade, 2005--2015, a decade-long effort to reduce by 50% the proportion of persons without sustainable access to safe drinking water and basic sanitation. Learn about spreadsheets. Two lectures have been added for Unit IV Module 15. The first, lecture covers spreadsheet software. The second dives into Advanced Microsoft Excel. Two new modules in Unit III have just been added. Three lectures for Module 12, Remote Sensing and Internet Data Sources, and Module 7, Watershed Inventory and Assessment were posted today.